Thank you for your interest in Saint Paul—Minnesota's capital city. Are you on assignment, researching for an upcoming story or a freelance writer? If yes, then you’ve come to the right place! 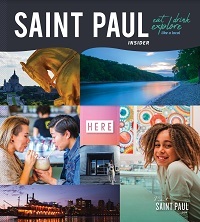 Visit Saint Paul provides assistance to qualified travel journalists producing editorial coverage of our area by arranging itineraries and facilitating visits to the attractions, cultural venues and other points of interest that will be covered in your articles, books and broadcasts. Travel arrangements are provided through the discretion of the bureau member and partner businesses, and are subject to availability and interest of each facility based on the number of requests we receive. Please note that our primary concern is assisting members of the working media and we are not always able to accommodate spouses, children and others accompanying working journalists. Ready to begin your journey to Saint Paul? Please complete the form below as thoroughly as possible and submit when ready. Please indicate what outlets you will be on assignment for and information about distribution (circulation/average visitors/month, etc). Please describe the type of story you have planned. Do you have a specialty area or any other special interests?